We will not offer a summer 2016 program. New program info. will be posted as funding becomes available. 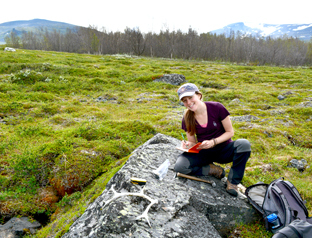 All NSF REU student opportunities are listed on NSF REU program websites. REU Research . 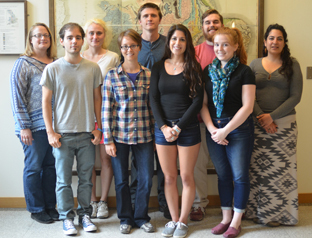 . .
2015 NERU Fellows on their first day at UNH, with program director Ruth Varner, and graduate mentor Natalie Kashi. 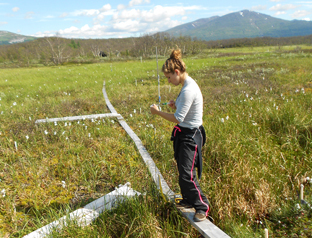 2013 NERU fellow collecting data and doing fieldwork in Stordalen Mire. 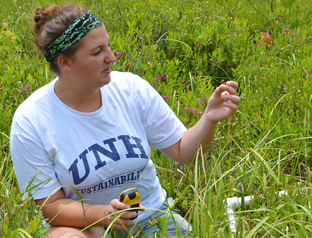 Samantha Anderson, 2013 fellow, doing species sampling at Sallie's Fen. Photo by K. Donahue. 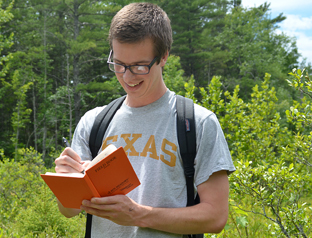 Michael Layne, 2013 NERU fellow, collecting data for species sampling project. Photo by K.Donahue. 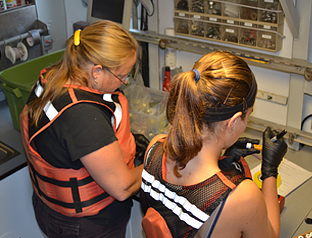 Dr. Ruth Varner (left) and 2012 NERU fellow Nancy Freitas (right) processing samples from the Great Bay estuary.